It feels a bit strange writing about the Wancher Storm Jet chronograph on 14 January 2018, the day before the start of SIHH, the show in Geneva that presents new watches by many of the world’s most prestigious brands, names such as Cartier, Panerai, Jaeger-LeCoultre, Piaget, Audemars Piguet, Parmigiani Fleurier and so forth. 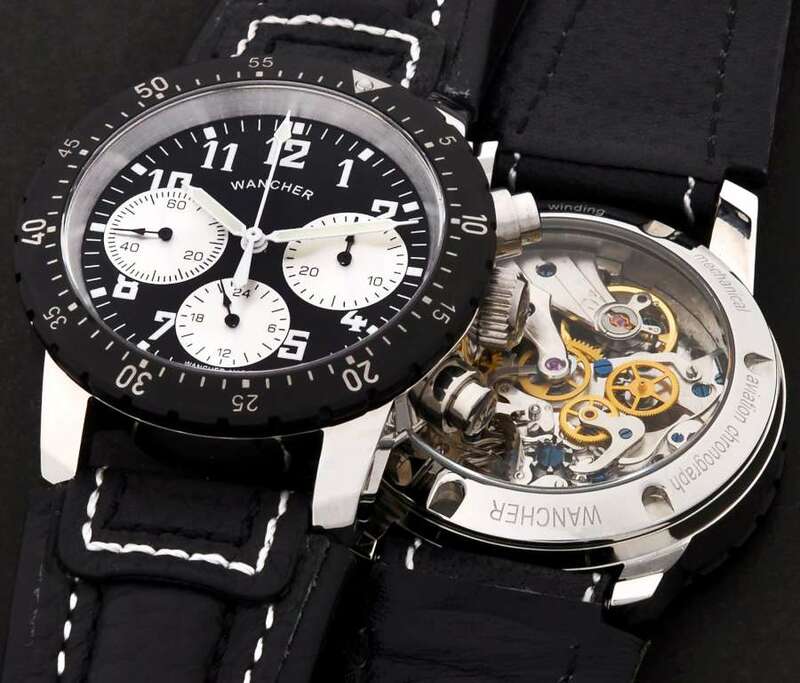 But one of the great divides in the world of mechanical watches is between watches that most people could afford, and watches that are destined for less than one percent of the population as a result of their high price. The Wancher Storm Jet, made in Japan with a 41mm case in 316L stainless steel and a hand-wound movement made in China, is a solid watch, with 10 atm water resistance, a bidirectional rotating bezel, and the chronograph complication, available new at under $500. It also packs a lot of history, and looks truly interesting when you turn it over. When it comes to affordable mechanical watches, it seems to me that there is another great divide. On one hand, there is the new generation of Swiss watches, Swatch Group brands such as Hamilton and Tissot using movements by ETA built industrially using concepts developed for the Sistem51. Movements that, in the case of Tissot, may have some plastic components, and have a very sleek, modern appearance when viewed through the sapphire caseback. And on the other hand, there are traditional movements, the previous generation of ETA movements, and their clones and copies made by other brands in Switzerland, and in other countries including China. It’s a question of personal preference, and on the sort of thing you want to see through the caseback. 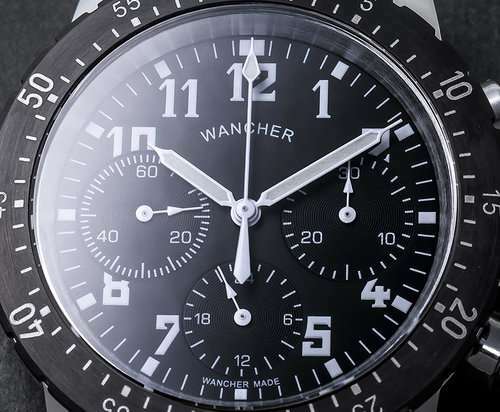 The Wancher Storm Jet has a pilot’s watch appearance, with bold numerals on a black dial, and the traditional reference triangle on the rotating bezel. The case is fairly thick at 14mm, but the 41mm case diameter makes it an easily wearable watch on most wrists. The subdials are for continuous seconds on the left, 30 chronograph minute counter on the right, and a 24-hour display at 6 o’clock. The rotating bezel, which has a black PVD coating, provides another method of recording times and setting countdowns. 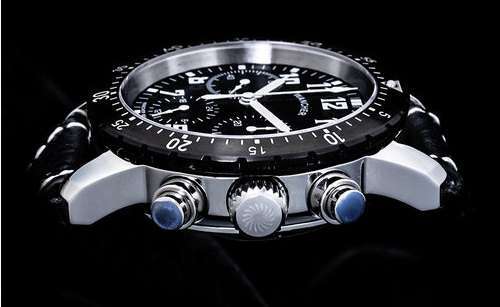 10 atm water resistance is impressive, attained in part by means of the screw-down crown. The chronograph pushers are not screw-down. 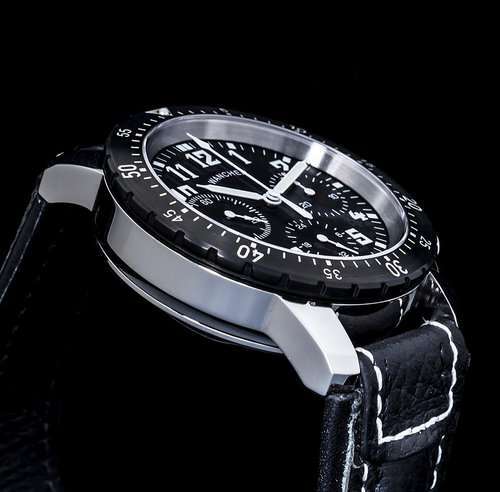 The hour, minute and chronograph second hands have sections of luminescent paint, and the hour numerals and indicators are also luminescent. At the 6 o’clock position on the dial, where you would normally expect something like “Swiss made,” you find the text “Wancher made”. The strap supplied with the watch is Japanese-made, in black leather with contrasting white stitching, and extra presence provided by a padded central section. The strap is profiled so that its width includes the lugs, so to speak. According from which online dealer you buy the watch, you may receive another two straps with the watch. The quality is not as high as a Swiss movement, but even so the ST19 chronograph movement is remarkable in that it is based on a column wheel. This makes pusher operation pleasantly smooth. The movement has a horizontal clutch and this may cause a bit of flutter in the seconds hand when you start the chronograph. 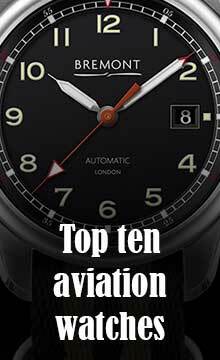 It is now made in a number of variants, and this Wancher Storm Jet has a hand-wound 20-jewel Seagull ST1903 movement with about 40 hours power reserve, running at 21,600 vibrations per hour (3 Hertz). Movement finish is industrial, and the blued screws visible in the photos are not blued, but simply painted with blue lacquer. Judging from comments on user forums, the ST19 is basically a sound movement, but occasionally it may be subject to problems caused essentially by insufficient quality control. But on the other hand, the watch is supplied with a guarantee. The Seagull ST19 movement is based on the Venus calibre 175, which was made by Fabrique d’Ebauches Venus S.A. based in Moutier and was used for many watches from its launch in about 1940 through to the 1960s. In about 1960, Venus was planning a refurbishment of its movements, and it had already sold the technology for the Venus 150 calibre to the Soviet Union, where it became the “Strela” movement used for military aviation watches. 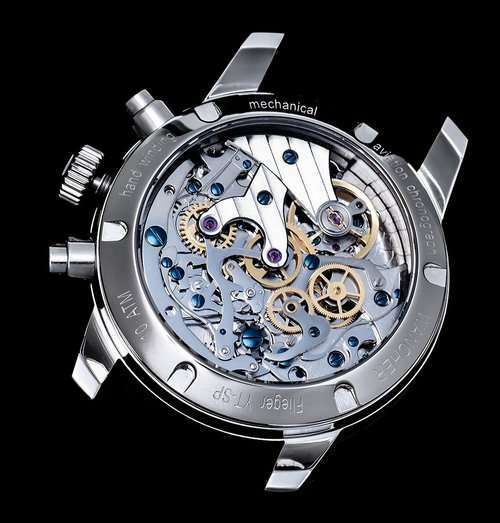 They offered the calibre 175 to the same Russian customers but they had no need for another chronograph movement. But the Chinese were looking to develop their own military chronographs. 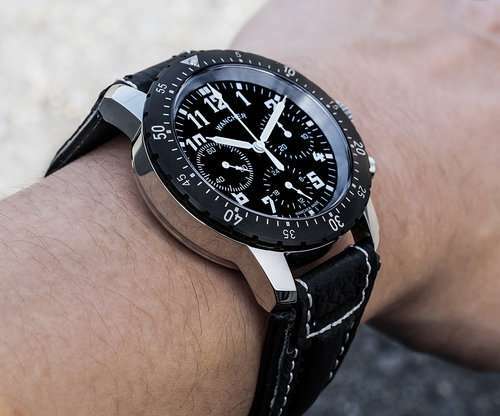 The Ministry of Light Industry specified an order to meet the requests of the People’s Liberation Army Air Force for an aviation chronograph. So Venus succeeded in selling its machine tools for the Venus 175 to the Chinese, and in particular the Tianjn Watch Factory. Tianjin modified the movement to 19 jewels instead of the original 17, running at 18,000 vibrations per hour, 2.5 Hertz. The prototypes were ready by 1963 and for this reason it is often known as the ST19 1963 calibre. About 1,400 watches were made and supplied to Chinese military pilots, but in later years, with the advent of quartz technology, the movement went out of production. Tianjin became the Tianjin Seagull Corporation in 1992, and in 2003 they began working on a remake of the ST19. 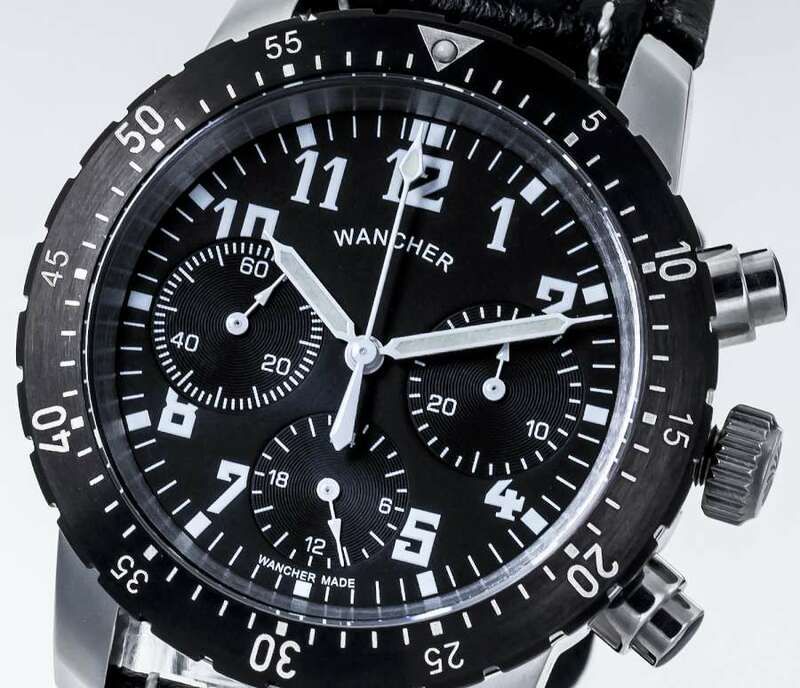 The Wancher Storm Jet Black Chronograph is reference WAWT-CHRONO-BKWTBKBKs-6525, and it costs $480. It comes with a one-year guarantee. More information and on-line purchase on the Wancher website.